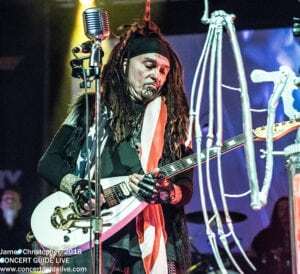 MINISTRY was in top form at House of Blues Thursday night, kicking off the Amerikkant tour. 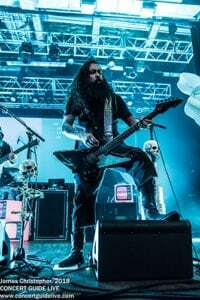 They played well, sounded good, the stage was well-lit, the live mix was LOUD but spot-on allowing enough separation between instruments – a feat in itself – with up to eight musicians at any one time. 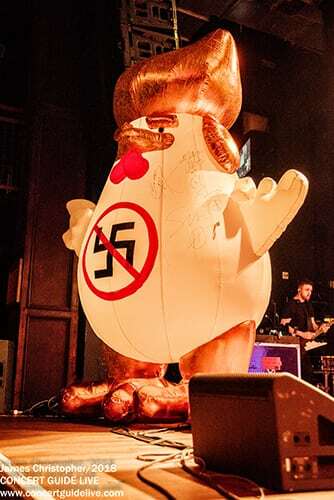 An eye-catching stage was adorned on each side with monstrous blowup chickens (turkeys?) sporting weird Trump-style hair and anti-Nazi symbols. 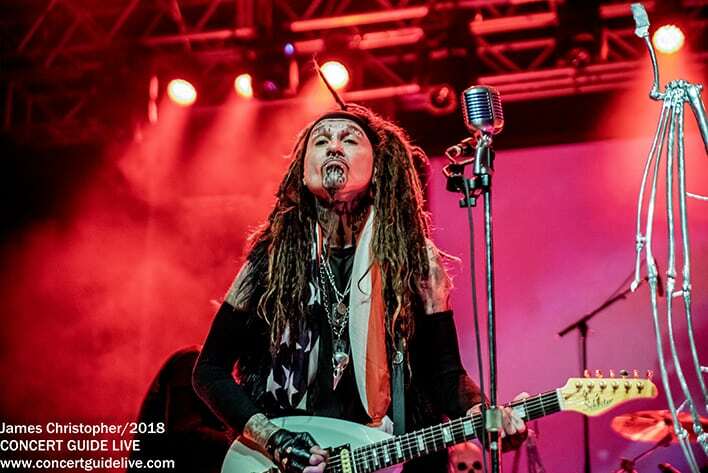 Stacks of neon television sets were strewn about the stage and a sea of creepy cool mic stands woven with skulls and silver bones were front and center. A video screen furiously projected in the background throughout the set as the anger within the newer songs grew and grew. Whether you’ve been, following Ministry through their various incarnations, or new to the world of Uncle Al Jourgensen, I cannot urge you enough to check out the latest album Amerikkant before seeing them on this tour. It’s in your best interest to familiarize yourself with these new songs – they’re the theme and motivation for the tour. 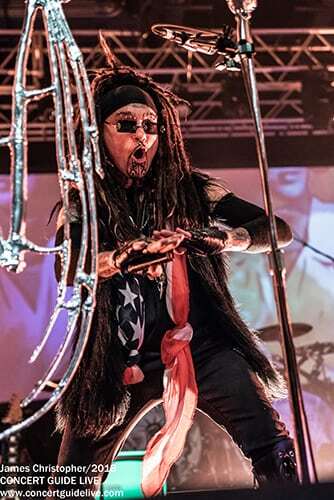 Ministry ushered in the evening with three tracks off Amerikkant beginning with the live debut of the lengthy, industrial-metal song, “Twilight Zone” that brings you into the fold, setting a unifying tone before moving into the live debut of, “Victims Of A Clown”. 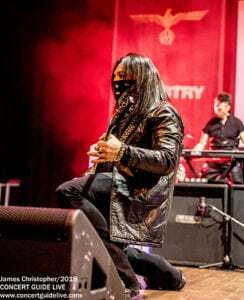 It’s another sure-to-be classic Ministry song, with guest vocalist Burton C. Bell (Fear Factory) taking over lead vocals while Jourgensen sang occasional backup but mostly played stunning guitar on his teardrop, masterfully using a distorted wah-wah effect and slide. A little past the midway point of the set, some of the “older” songs from the late 80s, early 90s, began to appear “Just One Fix,” “N.W.O.,” “Thieves,” and “So What”. The band was truly locked in at this point and became even looser playing the longtime fan favorites, culminating in a 13-song setlist, plus a single song encore – 1999s “Bad Blood”. All night, the frenzy of the crowd escalated as the energy of Ministry continued to fire on all cylinders. It never felt like they were just phoning it in. Everyone seemed keen to be on stage, playing great music both old and new. 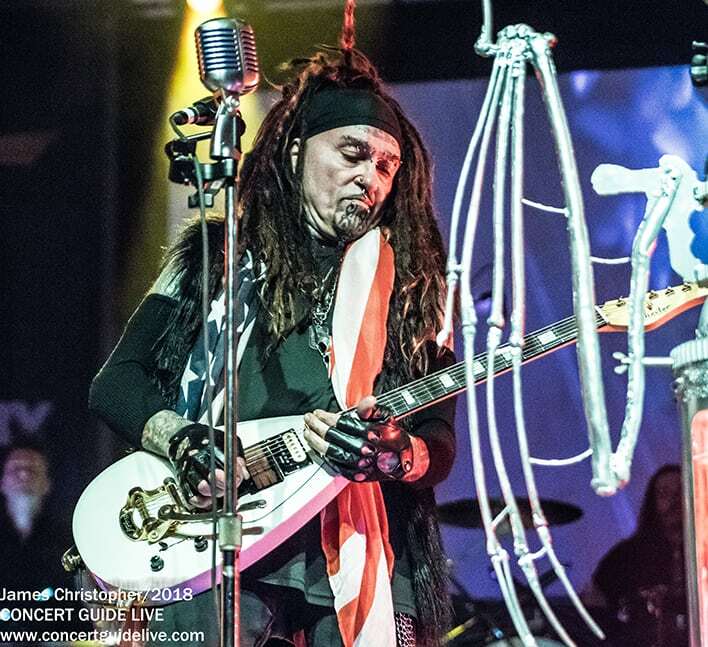 Ministry definitely took command in Anaheim, but they also provided a platform to let your inner angst run rampant for a couple of hours. Don’t forget to do yourself a favor – check out Amerikkant.